For over 30 years, Midwest Sanitation & Recycling has taken great “Pride in Service,” specializing in residential, commercial, and industrial waste management and recycling services, roll-off dumpsters, packer containers, and port-o-lets. We aspire to meet the needs of our customers and their communities by offering the best service available at affordable rates. The trash and recycling services our customers know and value today began in 1981, when Lyle and Kathy Vander Meiden, the owners of KAL Services, purchased Midwest Sanitation Service. At that time, the business consisted of four employees and two sanitation trucks. Fast forward to the current day where first and second generation family is working collaboratively together to bring Pride in Service. Midwest Sanitation & Recycling has grown to a full-service waste management and recycling company with over 40 employees and 40 trucks. 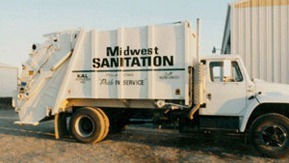 Through the years, Midwest Sanitation has expanded and diversified. In 1990, Lyle and Kathy foresaw a growth in the demand for environmentally friendly services. Today, Midwest Sanitation includes two recycling centers located in Pella and Oskaloosa. In September 2011, Midwest Sanitation expanded again with the purchase of Red Rock Rubbish. In 2013, the company acquired three additional businesses: Van Egmond, Kirby, and Thomas Sanitation. In 2018, two more companies were acquired, including Darrah Sanitation and McGee Sanitation. United under the name Midwest Sanitation & Recycling, our team of waste management and recycling specialists continues to look for ways to better serve our customers in and around Pella and Oskaloosa.